There are many reasons to attend massage school. Maybe you’re fresh out of high school and looking for a meaningful direction in life. Maybe you just lost your job and you’re looking for a new direction for a second career. Maybe all the kids have left the house and you’ve been dreaming of enrolling for years. Maybe you have other reasons all your own. Maybe it’s just to say that we understand. We understand, and we want to help you make the transition from your former life into your new massage therapist life as painless as possible. We understand that not every student was created the same. Some students have a college background and soak up all the new information like a sponge, whereas others may have never studied in their prior academic career. Some students excel in large group settings, whereas others may fall behind out of fear or shyness. Some students have excellent communication skills and know how to behave in a professional manner, and some students have never had to behave in that way before. If you’re falling behind, we have free tutoring sessions available Monday through Thursday after school. We asked one of our tutors to write a little piece about being a tutor. Here's what he wrote. The American Massage Therapy Association is partnering up with Soma to help ease your burden in many ways, too. Free student membership to all current students, which inclu des free access to all the Trail Guide flashcards. 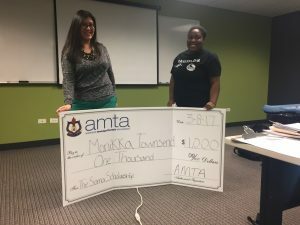 On top of that, the AMTA is offering $1,000 scholarships to Soma students four times a year. Monikka was our latest recipient. See more pics here. 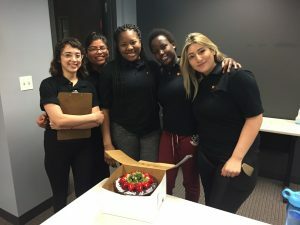 And if you’re feeling financially stressed as a student, Soma has also partnered with Food For Thought to provide part time employment for our students. With flexible schedules that can fit around your classes, Food For Thought might be the perfect way to earn some extra income while preparing for your new career. 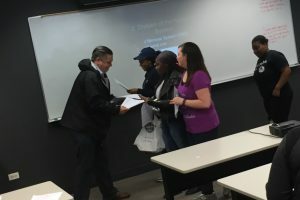 Here we see a representative from Food For Thought handing out applications to Soma students. On top of all that we have career services, which includes our Job Board for graduates and resume reviews by the president herself. We have free massages for students and graduates in our clinic. We have monthly MBLEx review classes hosted by Julio to make sure you get licensed. We understand you’re looking for more than just a massage school. You’re looking for a community. We hope you’ve found it with us.